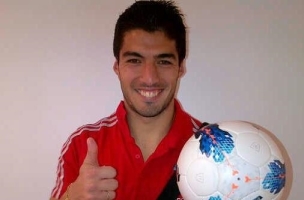 Uruguay Forward Luis Suárez used a Facebook post Monday to apologize for biting Giorgio Chiellini of Italy during last Tuesday’s 2014 FIFA World Cup Brazil match, for which he was suspended from Uruguay’s next nine international matches, as well as hit with a four-month ban from all soccer activities and stadiums. After several days of being home with my family, I have had the opportunity to regain my calm and reflect about the reality of what occurred during the Italy-Uruguay match June 24. I deeply regret what occurred. I apologize to Giorgio Chiellini and the entire football family. I vow to the public that there will never again be another incident like this one. 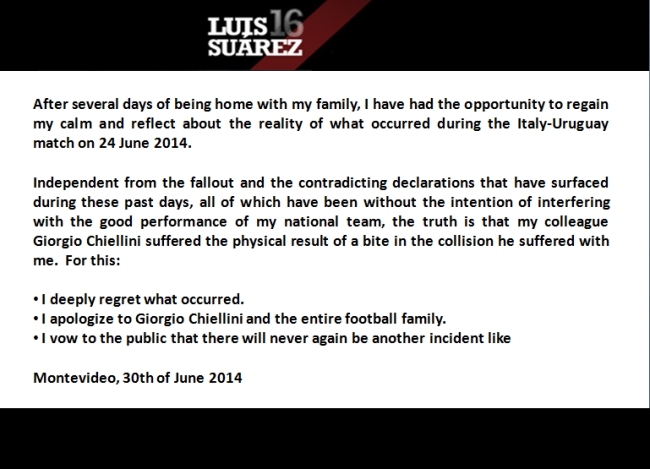 Readers: What did you think of Suárez’s apology?